Genisis 3.5: "And Adam lived an hundred and thirty years, and begat a son in his own likeness, and after his image; and called his name Seth:" K.J.V. The Arab singular (whence the French "génie"); fem. Jinniyah; the Div and Rakshah of old Guebre-land and the "Rakshasa,' or "Yaksha," of Hinduism. It would be interesting to trace the evident connection, by no means "accidental," of "Jinn" with the "Genius" who came to the Romans through the Asiatic Etruscans, and whose name I cannot derive from "gignomai" or "genitus." 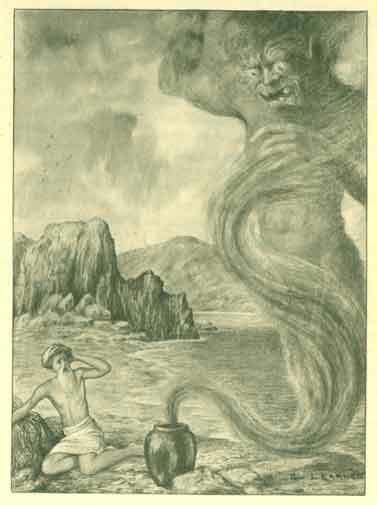 He was unknown to the Greeks, who has the Daimon (dai&mwn), a family which separated, like the Jinn and the Genius, into two categories, the good (Agatho-dæmons) and the bad (Kako-dæmons). We know nothing concerning the status of the Jinn amongst the pre-Moslemitic or pagan Arabs: the Moslems made him a supernatural anthropoid being, created of subtile fire (Koran, chapts. xv. 27; lv.14), not of earth like man, propagating his kind, ruled by mighty kings, the last being Ján bin Ján, missionarised by Prophets and subject to death and Judgment. From the same root are "Junún" = madness (i.e., possession or obsession by the Jinn) and "Majnún" = madman. According to R. Jeremiah bin Eliazar in Psalm xli. 5, Adam was excommunicated for one hundred and thirty years, during which he begat children in his own image (Gen. v. 3) and these were Mazikeen or Shedeem - Jinns. — The Book of the Thousand Nights and a Night, Volume 1, pg 10, translated by Richard F. Burton, Printed by The Burton Club for Private Subscribers only, 1885. Image from same source. ... when lo! a damsel appeared ahead and she was in tears. The King's son asked, "Who art thou?" and she answered, "I am daughter to a King among the Kings of Hind, and I was travelling with a caravan in the desert when drowsiness overcame me, and I fell from my beast unwittingly; whereby I am cut off from my people and sore bewildered." The Prince, hearing these words, pitied her case and, mounting her on his horse's crupper, travelled until he passed by an old ruin, when the damsel said to him, "O my master, I wish to obey a call of nature": he therefore set her down at the ruin where she delayed so long that the King's son thought that she was only wasting time; so he followed her without her knowledge and belhold, she was a Ghúlah,† a wicked Ogress, who was saying to her brood, "O my children, this day I bring you a fine fat youth for dinner;" whereto they answered, "Bring him quick to us, O our mother, that we may browse upon him our bellies full." † The Ghúlah (fem. of Ghúl)[Ed. Goul] is the Heb. Lilith or Lills; the classical Lamia; the Hindu Yogini and Dàkini; the Chaldean Utug and Gigim (desert-demons) as opposed to the Mas (hill-demon) and Telal (who steal into towns); the Ogress of our tales and the Bala yaga [ed. Baba Yaga] of Russian folk-lore. Etymologically "Ghul" is a calamity, a panic fear; and the monster is evidently the embodied horror of the grave and the graveyard. ... in Gandhāra, two thousand leagues away, there stands the city of Takkasilā. If you can reach that city, in seven days you will become king there. But there is peril on the road thither, in journeying through a great forest. It is double the distance round the forest that it is to pass through it. Ogres have their dwelling therein, and ogresses make villages and houses arise by the wayside. Beneath a goodly canopy embroidered with stars overhead, their magic sets a costly couch shut in by fair curtains of wondrous dye. Arranged in celestial splendour the ogresses sit within their abodes, seducing wayfarers with honied words. 'Weary you seem,' they say; 'come hither, and eat and drink before you journey further on your way.' Those that come at their bidding are given seats and fired to lust by the charm of their wanton beauty. But scarce have they sinned, before the ogresses slay them and eat them while the warm blood is still flowing. And they ensnare men's senses; captivating the sense of beauty with utter loveliness, the ear with sweet minstrelsy, the nostrils with heavenly odours, the taste with heavenly dainties of exquisite savour, and the touch with red-cushioned couches divinely soft. But if you can subdue your senses, and be strong in your resolve not to look upon them, then on the seventh day you will become king of the city of Takkasilā." Blee: Color, hue; complexion, visage; appearance. O.E.D.